This post features a reflection on my visit to the Atelier van Licht at the Centraal Museum in Utrecht, The Netherlands. The Atelier was being presented as part of the museum’s Nice’n’Light exhibition that ran from 17 October 2015 – 24 January 2016. Back in February 2016, I travelled to the Netherlands to meet with Annemieke Huisingh, the founder of the wonderful Atelier van Licht. I was interested in learning more about the Atelier’s approach to designing children’s material-based creative learning environments. At the time, the Atelier (which is another word used to describe an artist’s studio) was on display at the Centraal Museum in Utrecht as part of a contemporary art show that was exploring artist’s experimentation with light. 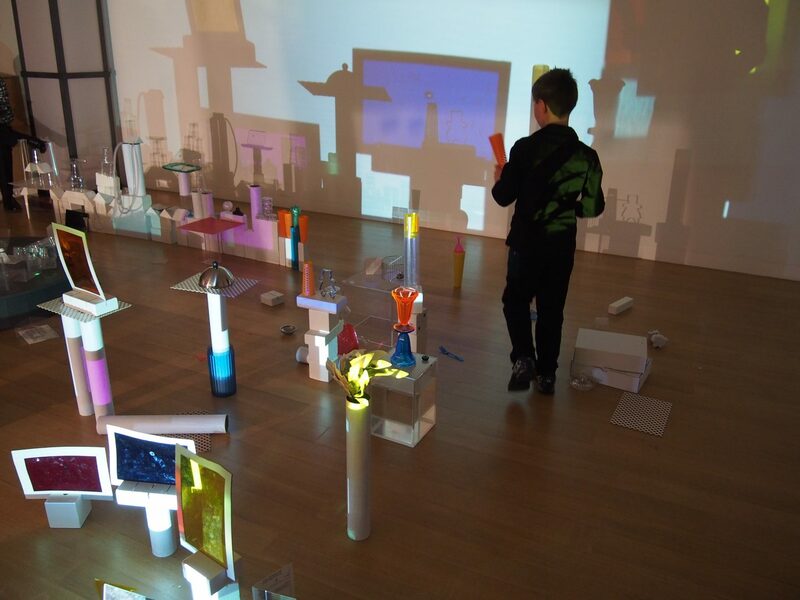 The Atelier had been designed for children of all ages to create and play with the material of light alongside viewing artworks in the exhibition. 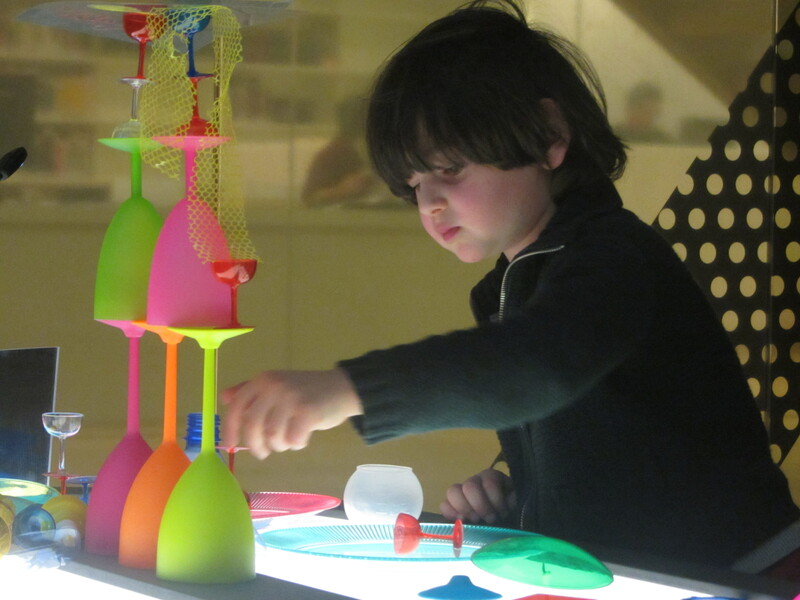 The space featured an array of transparent, translucent, opaque and reflective materials that children could play and experiment with in different ways. Walking into the Atelier space, there was a wonderful feeling of peaceful creative energy amongst the children playing in the space. An ‘atelierista’ – or creative facilitator wandered around the space, asking children questions and introducing new materials and tools where appropriate. The Atelier had been designed by an interdisciplinary team consisting of a pedagogue, scientist, industrial designer and artist. Together they had selected, develop and arranged the space so that it was simple in its design yet with high creative possibilities. For example, a light table in the Atelier featured a myriad of transparent and opaque plastic objects such as plates, cups and cellophane mesh (pictured above). These materials did not have a pre-determined way that children needed to use them. Rather, they served as an open-ended invitation to experiment with how they could be stacked, arranged and positioned in creative ways on top of the glowing surface. During my visited, I talked with Annemieke about the importance of developing ‘creative studios,’ such as the Atelier van Licht for young children in communities. 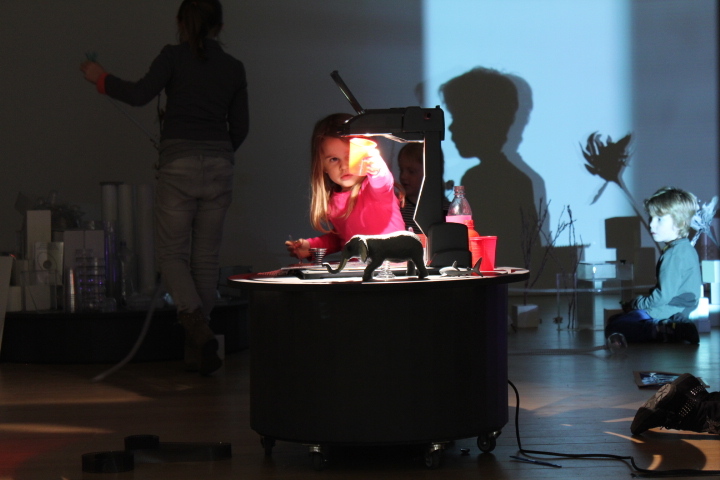 While many creative practitioners have a space for making, such as a cook has his kitchen, a furniture maker has his workshop, a dancer has a studio, at present there are very few places where children can go to freely experiment and play with materials. Annemieke pointed out that such a ‘creative studio’ could be located anywhere, such as in a kindergarten, library or museum. I was so inspired by Annemieke and her team’s creative approach to designing the Atelier. I felt like there was such thoughtful consideration that went into the selection of materials, their arrangement as well as stuff that were experienced in supporting children’s creative learning. I was so impressed by the team’s interdisciplinary approach to children’s learning. This reminded me a lot of The Tinkering Studio’s and Reggio Children’s ‘atelier’ approach to making children’s creative activities. 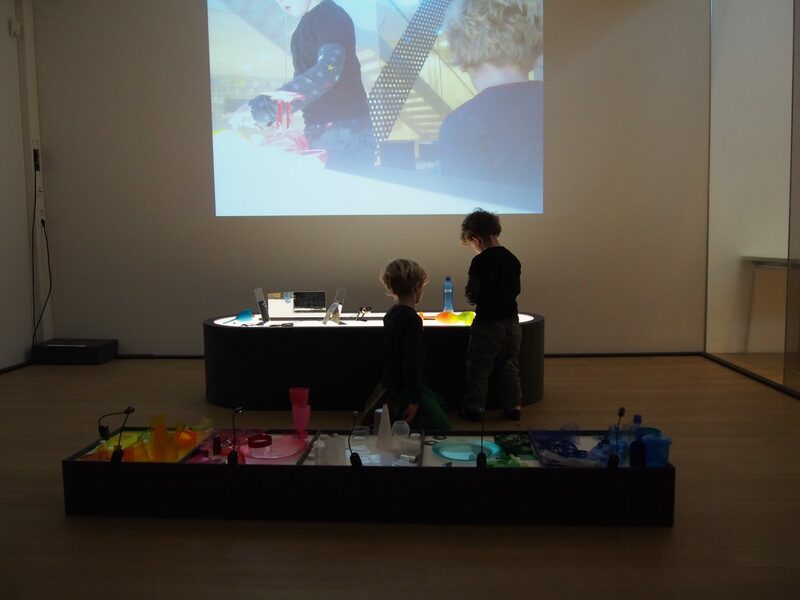 My visit to the Atelier van Licht also made me reflect on my own work designing material-based activities for children in art museums – in particular, on the role of play in children’s learning environments. Early childhood educators so often need to advocate for children’s right to play as it is often dismissed as being something that is oppositional to learning. In many pre-schools, play-based learning is being pushed to the side and replaced with activities that aim to increase children’s numeracy and literacy skills in preparation for the entrance to school. However play has also been proven to act as a critical process that supports people in constructing, exploring and producing new ways of experiencing the world. Overall, I was very grateful to spend time connecting with such a thoughtful team that was producing such innovative education practice. I highly recommend following their work and keeping an eye out for and activities they are running. The original version of this post was published in February 2016. This post is an updated version of the original text.